After you’ve used an accountant’s copy of the QuickBooks 2013 data file to correct transactions or to enter new transactions, you export the changes so that they can later be imported into the client’s data file. To do this, choose the File→Accountant’s Copy→View/Export Changes for Client command. QuickBooks first displays a window that lists the changes you made to the accountant’s copy. Note that you can print this list or create a .pdf of it by clicking the Print or Save as PDF button. If you click the Create Change File for Client button, QuickBooks displays the Save Accountant’s Export to dialog box. This dialog box works like a standard Windows dialog box for saving a file or document. You use the Save In drop-down list to identify the location of the changes file. Then use the File Name box to give the file a unique name. When you click Save, QuickBooks saves the changes that you’ve made into a file. You later import this file, or have the client import this file, into the QuickBooks data file. If you click the Send Changes to Client button, QuickBooks displays the Save Accountant’s Changes dialog box. 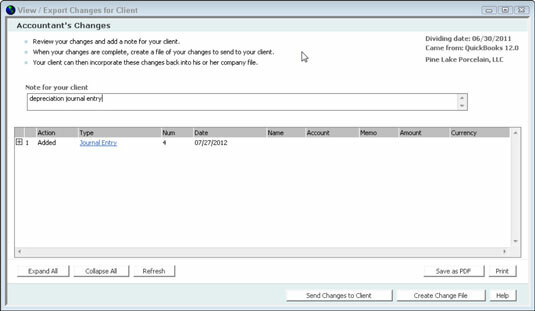 This dialog box collects the information necessary to send the client an e-mail with instructions about how to import the accountant changes and a link the client can use to retrieve the actual accountant’s changes. One neat thing about this option is that QuickBooks tells the accountant when the client grabs the changes. You don’t keep your accountant’s copy of the data file. In other words, the accountant’s copy is just a temporary copy of the data file that you use to identify and create a set of changes necessary to update or correct the client’s records. After you make the changes, you export the changes to a changes file. Then the client imports those changes. If you make changes again sometime in the near future, you have the client create a new — a brand-new — accountant’s copy. To identify when you’re working with an accountant’s copy, QuickBooks displays the parenthetical phrase (Accountant’s Copy) along the top of the QuickBooks program window. QuickBooks also identifies regular QuickBooks data files for which accountant’s copies have been created by adding the parenthetical phrase (Accountant’s Copy Exists). This phrase appears only on the QuickBooks program window title bar from the point when the client creates the accountant’s copy to the point when the client imports changes from the accountant’s copy.